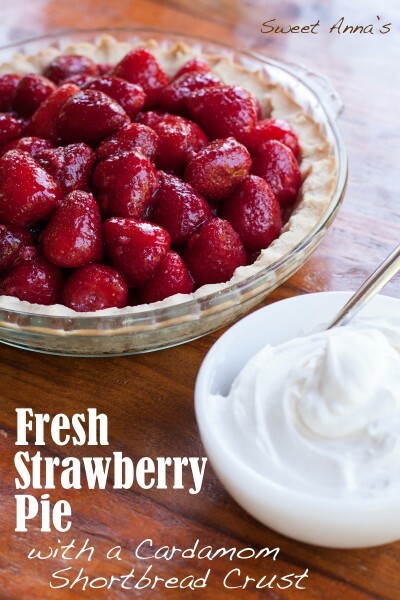 Fresh Strawberry Pie with an Easy Cardamom Shortbread Crust & Fresh Cardamom Whipped Cream! I just can hardly contain my excitement when it comes to our local strawberry season. I become obsessed for the entire duration. I wake up dreaming of berries and I go to bed with stained fingers. No joke! Maybe it’s the long-time city kid in me, but I just can’t believe that I get to drive 5 minutes to the most gorgeous berry farm and grab freshly picked berries all summer long. You guys! It is just bliss! We can pick our own berries if we are feeling fiesty, but usually I just grab a couple of already picked flats and enjoy the fruits of my non-labor. With 3 little kids always in tow, it doesn’t get much better than that. Now, we all love berries, so we usually don’t get much farther than eating the berries as fast as we can, with a few batches of freezer jam thrown in for good measure. 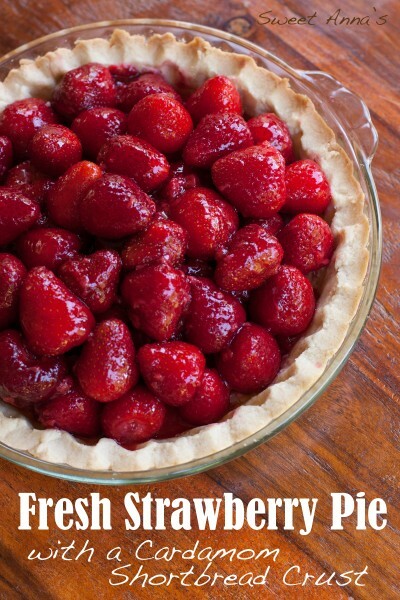 But this morning I was hit with a bit of nostalgia and I just couldn’t resist whipping up a fresh strawberry pie. Does anyone else remember the days of Marie Callender’s restaurants? (Are they still around at all?!) 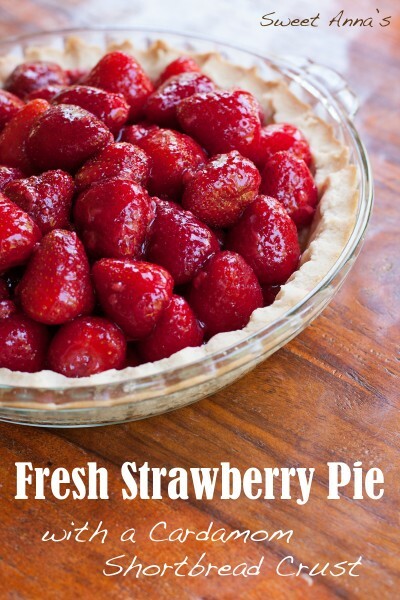 I don’t remember much about the food, but I do remember that I lived for their fresh strawberry pie when it came into season and I would just dream of the chance to go eat there and have a slice. I was never disappointed with that slice of amazing strawberry goodness, and this morning I couldn’t figure out why I had never made one myself?! I threw together a quick press-in-the-pan shortbread crust, and an easy glaze made out of my homemade strawberry freezer jam. Adding a touch of cardamom was a given, as my norwegian blood can never get enough, but if you are not a cardamom fan, feel free to leave it out. This pie is best served the day it’s made. I can’t tell you how it is on day two, it will never last that long around this house! Also, the amount of strawberries needed is just an estimate. 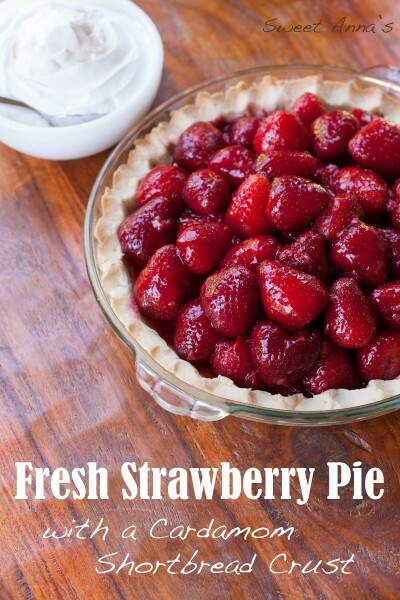 Use enough to fill your pie crust. That’s what matters! In a large mixer bowl, mix together the butter, flour and powdered sugar for the crust until just combined. Divide the mixture in half and press each half into the bottom and up the sides of a deep-dish pie plate. Place in the fridge to chill for at least 30 minutes while the oven preheats. Preheat the oven to 350ºF. Bake the crusts for 12-18 minutes, until golden, and let cool completely on a cooling rack. When the crusts are cool, in a large bowl, whisk together the strawberry jam and water until smooth. Dump in the strawberries and toss very gently (use your hands!) to coat all the berries. Arrange them evenly into the two cooled pie crusts. Chill in the fridge while you make the whipped cream, and up to several hours, before serving! To whip the cream, whisk together the heavy cream, powdered sugar and cardamom in a cold bowl until very light and fluffy. Chill until you are ready to serve!